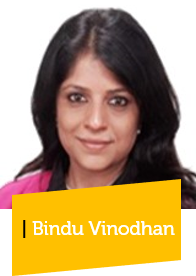 Bindu Vinodhan is an International Coach Federation certified executive coach and an HR professional with almost two decades of experience in Learning and Development. She was Global Head- Learning and Development, at WNS Global Services in her last assignment. In her previous assignments' she handled ‘Organizational Effectiveness and Change’ and ‘Organizational Learning and Development for companies like Vodafone, Hewlett Packard and Bank of America where she was instrumental in designing and developing capability solutions for next-generation leaders. Her core areas of expertise are in senior leadership transformation, executive presence, business storytelling and high impact presentation, women leader empowerment and global leadership. Bindu holds a Bachelor’s Degree in Engineering, specializing in Electronics and Telecom; and a Master’s Degree in Education, specializing in Learning Technology from Oxford University. She is also trained and certified on high impact business presentation skills and presence from Cranfield University. She also delivers guest lectures at Oxford on the subject ‘Applications of Learning Technology at the Workplace’ and has been doing that consecutively for the last 5 years.